Metastatic tumors within the spine can lead to intense pain and impaired mobility as bone weakens. Often tumors in the spine cause pain with or without a fracture due to the inflammation caused by the tumor that frequently affects the spinal nerves or the spinal cord as well. Witt recalls treating a patient with multiple myeloma with four separate epidural catheters to control the pain because the tumor had obstructed the epidural space. Witt contends that opioids alone cannot effectively treat all cancer-related pain, particularly when there is a neuropathic component, as often occurs with spinal metastases. He says that since completing his formal training in pain management in 1978, controlling the pain due to spinal metastases has been one of the more challenging procedures. Witt has extensive experience in treating chronic pain of all types including the pain caused by vertebral compression fractures due to osteoporosis. This experience has led him to offer this new treatment for pain caused by spinal tumors. For many years, patients with metastatic spinal tumors have been effectively treated with radiation therapy, and this is still an excellent option. However, t-RFA now offers an alternative by delivering radiofrequency energy in the palliative treatment of these tumors with a single outpatient procedure. This provides cancer patients with rapid pain relief while allowing them to continue systemic therapy, such as chemotherapy or hormone therapy, to treat their primary cancer. T-RFA still allows patients to receive focal radiation therapy if necessary. 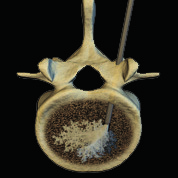 Because any tumor ablation can weaken the vertebral body, this new approach allows Witt to inject methyl methacrylate cement through the same needle to stabilize the bone and prevent a fracture once the tumor is ablated. T-RFA is typically an outpatient procedure that is performed through a small incision using sedation and local anesthesia. It takes, on average, 45 minutes, and the patient is usually released for home recovery and care within hours. A small steerable device allows Witt to target precisely where the device’s radiofrequency energy is delivered to heat and destroy the spinal tumor, minimizing damage to surrounding tissues and vital structures. In most cases, patients with pain associated with spinal tumors have experienced dramatic pain relief with a single treatment. 50 percent of patients reduced their pain medication. Otherwise inaccessible lesions were treated. It was an option for those who failed or could not undergo radiation therapy. There was no disruption of other therapies and protocols the patients were receiving. The further growth and canal extension of the treated tumor was arrested. An increased quality of life was demonstrated. SEER Cancer Statistics Review, National Cancer Institute, Noone, et al. 2 Anchala, Irving, Hillen, Friedman, Georgy, Coldwell, Tran, Vrionis, Brook, & Jennings Pain Physician 17 (4).